As an IT director, IT admin, or help desk technician, you are likely bombarded with support requests on a fairly consistent basis. But regardless of whether you have a solution in place to assist with the go-between work that’s required to resolve these issues, the tools you use to do so may not provide the full level of functionality that’s required for most businesses today. IT service management, or “ITSM,” is about solving issues quickly and restoring end-users to productivity. We all know, however, that sometimes this task is far from simple. Watch this video to see firsthand the power of this affordable and easy-to-use remote support solution. DameWare Remote Support is a secure, self-hosted remote support solution that helps IT pros provide technical support to end-users. Every copy of DameWare Remote Support includes DameWare Mini Remote Control, a robust support tool that lets you control Windows®, Mac® OS®X, and Linux® computers located anywhere in the world. 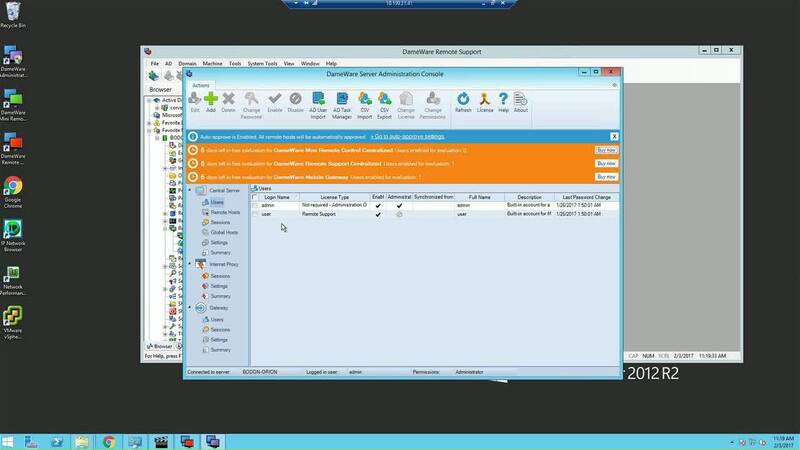 The combined DameWare Remote Support and Mini Remote Control solution offers a host of troubleshooting tools to help increase the efficiency of IT administration and desktop support, improve communication with end-users during remote sessions, and decrease time to resolution for IT issues of all sizes. This, in turn, contributes to the goal of providing excellent customer service and end-user support.